The Canon EOS 40D offers a reasonably accurate optical viewfinder, which Canon says will provide about 95% frame accuracy. Within the viewfinder display is an array of available AF points, as well as a lower information readout reporting basics such as exposure compensation, exposure settings, flash mode, focus status, etc. In addition to the EOS 40D's optical viewfinder, the camera features a Live View mode for its rear-panel LCD monitor. Unusual among digital SLRs, the Live View mode lets you use the LCD monitor for a larger viewfinder, and offers an exposure simulation option which displays the expected outcome of your chosen exposure settings (see below). 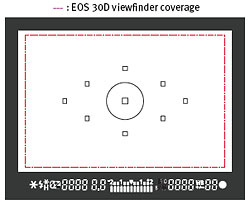 Like a larger version of the optical viewfinder display, the Live View display reports the exposure information along the bottom of the screen, and highlights the selected focus area with a white rectangle. Live View mode includes both a display with no information, and a display with minimal information across the bottom. Pressing the INFO button cycles through the two additional available displays. Pressing the zoom button zooms in to display what's in the center box. Pressing the zoom button again zooms into 10x magnification, great for fine focusing. You can move the zoomed area around in the box, using the legend as a guide. Most useful in Live View mode is the ability to zoom, as shown above. You can move the zoomed area around the screen to verify focus wherever you need it most. The Canon 40D's viewfinder has been enlarged slightly from past models, appearing just a little bigger than the Canon 30D, and a lot bigger than the Canon Rebel XTi. It's still smaller in appearance than the Nikon D80 and D200, but it's good that its bigger than past offerings. The outline at left shows the size difference between the 30D and 40D. It's certainly a lot more comfortable to use with glasses, with its slightly higher eyepoint, which means that it requires less squinting and you don't have to press your glasses as firmly against the rubber eyecup. It's not exactly gigantic, but any improvement in apparent size is welcome. The new Canon 40D viewfinder now shows a little more information than the Canon 30D, including an ISO readout to the right of the Exposure Level Indicator, and a two-digit maximum burst readout. Just left of the ISO readout is the Black & White mode indicator. The spot meter circle has increased to match the 3.8% area, now larger than the Canon 30D's 3.5% spot coverage. Focusing Screens. A first for this level of Canon digital SLR, the EOS 40D now has two optional screens available. The first screen shown below is the standard screen that comes with every 40D. The second offers a grid for setting alignment, and the third is what Canon calls Super Precision Matte, which is meant for lenses with maximum apertures under f/2.8. This latter screen will allow for more precise focusing when used with these faster lenses, but it will darken if used with slower lenses. The two optional screens are priced at $45 each. Good accuracy from the optical viewfinder. Live View mode is very accurate. The Canon 40D optical viewfinder is a bit tight, showing approximately 95% coverage. 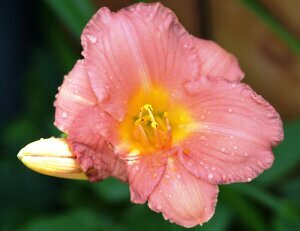 These results are typical for a non-pro SLR, although as usual, we wonder why more manufacturers don't make SLR viewfinders cover 100% of the frame. The 40D's LCD covered 101% percent of the frame in Live View mode.